Add a unique retro look to your Chevrolet HHR! 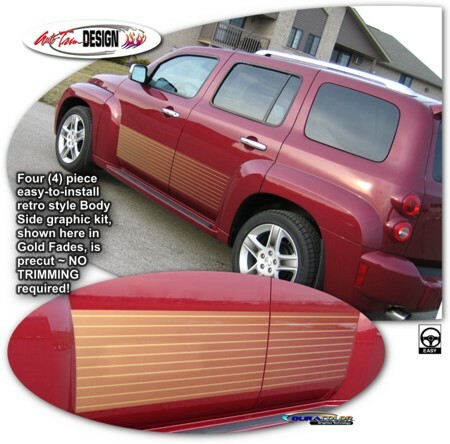 This awesome body side graphics kit is designed to fit perfectly on the lower area of your HHR's door panels as shown. Starting with a 80% fade at the front, the graphic gradually fades to the rear and features solid decorative horizontal pins. Available in four (4) Fade colors (Gold Fades shown). As an extra step, graphic pieces are over-laminated with a 2.5 mil clear laminate which protect our kits from miles of abuse. Very easy to install, this kit is precut - NO TRIMMING required - and is set to be placed approximately 1" (25.40mm) above the HHR's distinct bottom body line as shown. This graphic kit will fit any '06-Current Chevrolet HHR.